Emily never lived in Seattle’s Blue Diamond apartments but now she’s packing up her parent’s unit following the death of her abusive, alcoholic mother. An awkward misfit who aspires to be an artist, Emily is stuck working for her famous father in a job she hates. She has to dodge her father’s efforts to set her up with eligible men and advance her career in his company as she pursues a romance with post doctorate physics student, James, who lives in a unit upstairs. Competition is fierce between James and his fellow students. When a position is rumored to be available at Cern, one of James’ peers will stop at nothing to ensure she gets it. Colby doesn’t want to be back in Seattle. His frustrations bubble over, channeled into bigotry and disgust. An altercation at a bakery sets him at odds with drag artist Charlemagne, who makes it her mission to get Colby kicked out of the Blue Diamond. Every Moment and Not a Second More is an intimate study of personality and human relationships across the spectrum from loving to abusive. Each character in this novel is distinct and nuanced although not necessarily likeable or relatable. Hanson captures both their inner lives and their varying levels of societal integration with precision. Every Moment and Not a Second More becomes progressively darker as tensions between the characters increase and painful secrets are revealed. The denouement delivered one blindside after another as the lives of the Blue Diamond’s residents descend into madness and death, both of which Hanson details with surprising tenderness. Every Moment and Not a Second More is a contemporary fiction novel written by Natalie Hanson. Emily loved painting. She harbored no illusions that she was the next great undiscovered prodigy, and she despaired of the idea of actually being able to make her art her full-time profession, but she had an affinity to painting that she couldn’t really explain -- even to herself. Her happy place was the Seattle Art Museum where she would spend hours happily immersed in art and imagine her own place in those hallowed ranks. When one of the museum’s employees stopped to chat with her as she was gazing at a painting, she rather shyly confessed to having painted one or two pieces. Emily knew she shouldn't discount her efforts; she had painted dozens of landscapes, all colonial for some reason, but she couldn’t help herself. When the employee informed her about the museum’s upcoming contest, Emily was tempted, but something held her back. Something was always holding her back and making her be less than forthcoming with the people she met. Every Moment and Not a Second More is an elaborately textured and compelling story centered around a four-unit apartment building and the disparate worlds of the occupants that somehow become a unified presence. Hanson’s characters are marvelous, especially Charlemagne, the drag queen in one of the upstairs units; James, the physicist whose academic life is threatened by the hostile force that is Gi, a Korean orphan; and Emily. The plot is richly entwined with their lives and interactions, and throughout it all lurks the almost malevolent and self-centered presence of Emily’s father. As I listened to his complaints about her slowness in cleaning up his mess, I wished Emily would wash her hands of the whole business and take him down a peg. His expectation that she should perform the work of a housekeeper rankled even as I grappled with the subdued chaos of her life. Every Moment and Not a Second More is one of those stories that is blissfully easy to get caught up in and quite difficult to put down until reaching the last page. It’s most highly recommended. There is only one word that would do justice to Natalie Hanson's Every Moment and Not a Second More: Wow! What an amazing and spellbinding plot. The book revolves around six major characters -- Emily, her father (Warren Higga), Colby, James, Charlemagne (aka Mac), Gi -- and other very strong supporting characters. Although these characters seemed like individuals with their own place in the book, they were all tied together magnificently in the plot. Emily is a thirty-six-year-old single woman who has lost direction in her life and is very confused. Her father, Warren Higga, built a very successful business from scratch and the thought of his daughter spending her life doing nothing worthwhile haunts him. On the other hand, his constant interference in Emily's life bothers her to the core. While the father-daughter duo struggles in understanding each other, the other characters have several struggles of their own. The book has many elements that work in its favor. My favorite ones among those are the stimulating storytelling and genius character building. Natalie Hanson is a gifted writer. She knows exactly how to lure her readers into a gripping plot. The characters seemed so simple in the beginning. It felt as if I understood each of them when they were introduced; however, soon I realized how cleverly the author played me. There is a lesson there as well; we cannot judge anyone entirely by their actions, we must know their whole story to actually understand their perception. Every Moment and Not a Second More is a fabulous read that caught my attention and refused to let go. I lost track of time and knew that I would not put down this book before learning how everyone's lives turned out in the end. I loved this book and would recommend it to readers who enjoy stories with drama, intrigue, and excellent characters. This book has it all. It is about you, me and everybody else. This book teaches readers about perception, love, respect, and honor. 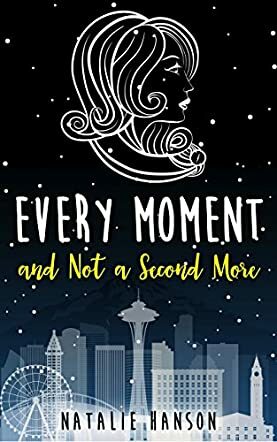 In Every Moment and Not a Second More by Natalie Hanson, Emily is a socially awkward artist in her thirties, who is struggling to live up to the expectations of her wealthy and successful father, Warren Higga. When her alcoholic mother passes away, it is left to Emily to organize the family belongings in their apartment. The apartment block is shared by some extraordinary characters who suddenly enter her life and transform it forever. A shy particle physicist student on the brink of a huge scientific discovery, a drag queen, and a troubled teenager trying desperately to forget his horrific past all have hidden secrets and are trying to make sense of their lives and uncertain futures. As their relationships grow with one another, the hidden veil of secrecy uncovers shocking revelations that will finally put their ghosts to rest. An unforgettable story of friendship, love and the importance of being true to yourself. I was completely hooked by this witty and engaging story from the outset. This laugh out loud, fast-paced tale has some of the most captivating characters I have ever read. The author has clearly created these personalities with care and consideration, which is evident in their unique dialogue and their character development as the story progresses. I have experienced every emotion imaginable while reading this book, from outbursts of laughter, to wishing Emily would find her voice to confront her overbearing father, to gasps of horror at the explosive revelations at the end. The relationship between each character was superbly written, especially the relationship between James and Emily; ‘You remind me of snowflakes and stars. And slices of lime.’ The conflict was perfectly placed throughout. I really felt myself caring about the characters and hoping they would come through and find peace in their lives. I feel the novel has a clear message to be the best version of yourself and to always follow your chosen path and not the path that has been chosen for you. I hope there will be a follow-up novel. A faultless story and one that I will be recommending to others.